Trim outer leaves of cabbage and toss out. Remove 4 good leaves and boil about 5 minutes. Chop remaining cabbage and cook about 5 minutes; drain well. Mix soup with milk, salt, pepper, onion and mustard and heat, stirring until well blended. Heat sausages in boiling water about 3 minutes; drain. Place sausages on cabbage leaves.Make a slit in each sausage and fill with 1 tablespoon of soup mixture. 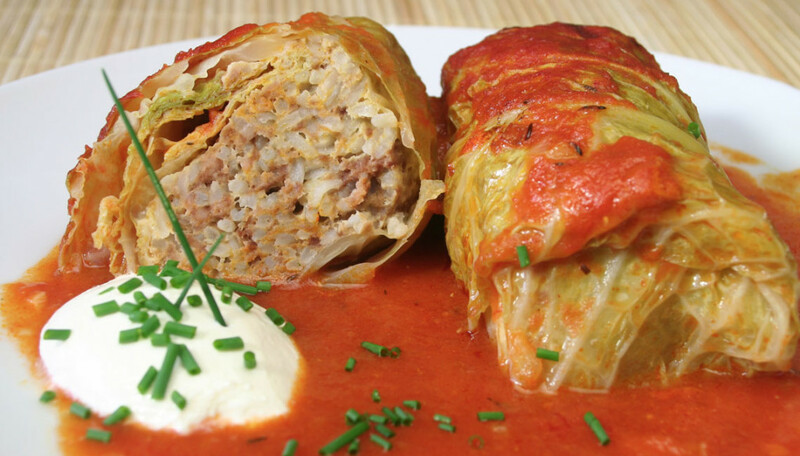 Roll cooked cabbage leaves around each sausage and place in a 1 ½ quart baking dish. Pour remaining soup mixture over cabbage rolls and top with cheese. Bake at 350º for 35 to 45 minutes until golden brown. Microwave covered on high 6 to 10 minutes or until heated through completely.